Ruby's Reefette is one of those divesites that has many interesting things to see. 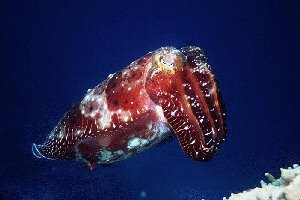 This site is known for cuttlefish on the southern end of the divesite near a cave. Ruby's reefette has many caves, with some of them quite long. One of the caves at this dive site ends in a hole at the top of the reef leaving the diver in 6 feet of water to explore the colorful corals that cover the top of the reef. This divesite also has several large bommies that take on the effect of mountains when the dive is made during dusk. This site features many small reef fish such as tangs, anglefish, eels, and pufferfish. The dive site is a large oval shaped reef structure with many caves and swimthroughs. All of these structures can be explored safely, as the end of the swimthroughs can be seen when entering. On the southern end of the reef is a large arch that has a large fan in the middle. Swimming under the arch is not advised as this will damage the fan. The best way to enjoy Ruby's reefette is to start in a northly direction so that the swimthroughs and caves can be explored when the diver has the most air. After exploring the swimthroughs on the northern and eastern parts of the reef, continue around the eastern part of the reef moving south to the arch. Follow the reef around the arch and the diver should find the boat.